Secretary Clinton: THEY CAN’T WAIT! Secretary Clinton had strong words for the UN Security Council this month, calling its failure to act in Syria a “travesty” and pledging to “redouble our efforts outside of the United Nations” to support the Syrian people. 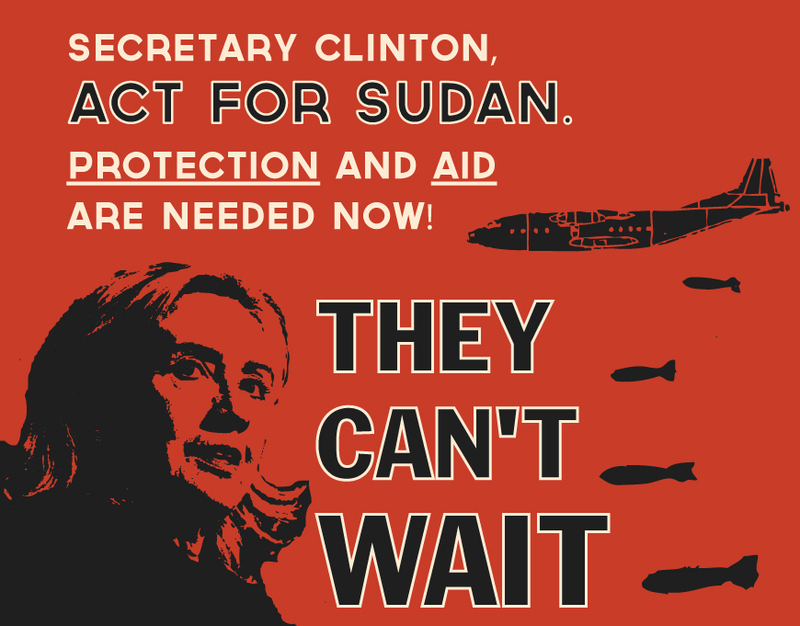 Sudanese civilians have waited too long for the same level of commitment by Secretary Clinton and the international community, as their government wages a genocidal war against them. The Sudanese government is preparing a full-scale military assault on the Nuba people in South Kordofan. Hundreds of thousands of civilians are at risk because evacuation routes are blocked in addition to the continuous blockade of humanitarian assistance by the Government of Sudan since June 5, 2011. Dear Secretary Clinton: Like Syrians under attack by their own government, innocent civilians in Sudan need immediate protection from the Government of Sudan. Please Act for Sudan – protection and aid are needed now! Hundreds of thousands of lives are at stake.